ups: Uh... I guess the graphics are OK? downs: Sluggish gameplay; mediocre controls; no multiplayer. I want Majesco to succeed. To me, they are the little company that could. Unfortunately, they just seem to be getting by on the franchises that they have acquired. They funny thing is that I\'m sure they don\'t expect a whole lot from this game. Americans aren\'t known for their love of soccer. It requires us to be in much better shape than we are and have much longer attention spans than our 22 minute sitcoms would allow. Beckham soccer will soon be forgotten. I\'ve only finished playing it a few minutes ago and I\'m already starting to forget about the game. I don\'t understand celebrities who attach their names to mediocre products. When you have millions upon millions of dollars, what would posses you to hock substandard fast food or poor excuses for videogames? Sometimes I feel like Charlie Sheen confronting Michael Douglas in Wall Street, \"How much is enough? How many boats do you need?\" I know I\'m paraphrasing. When Tony Hawk lent his name to the Pro Skater series, I like to believe that he saw some real potential in the franchise and he wanted to lend his support. I know his motives weren\'t completely altruistic, but I do like to believe that he wouldn\'t have endorsed a substandard game. I want to give Beckham the benefit of the doubt, I\'m assuming that he doesn\'t play videogames and thus has absolutely no idea just how poor a game his name is attached to. I would counsel him to procure some gaming flunkies to hang about and tell him when his name is being sullied by a crappy game. I think all of the big stars need gaming flunkies. The graphics are passable for a Gameboy game, the only problem is that the actual players on the field are so small that it can be a little confusing at times as to who actually has the ball. There are a lot of gameplay options, but there just doesn\'t seem to be any point to it all. It ends up being the same game any way you play it. I\'ve been on soccer fields, and they just seem a whole lot bigger than they do in this game. There\'s very little sense of scope or grandeur to the game. It\'s not the Gameboy\'s fault. I\'ve played games on this system that have felt epic. This is not one of them. The \'Train with Beckham\' phase is interesting. I thought it would be an opportunity to hone my soccer skills, but instead it simply showed me how the game worked. It\'s got a very simplistic pass, score set up that soon grows tiresome. The controls are incredibly basic. The game doesn\'t make any use of the shoulder buttons. There is a long kick and a short kick with the A and B buttons. It gets pretty repetitive and tiresome pretty quickly. The biggest omission this game makes is the lack of a multi-player mode. I don\'t understand sporting games that don\'t have multiplayer. It makes no sense not to be able to play this game with those you love. However, I guess if you really loved them you wouldn\'t force them to endure this game with you. So maybe the lack of a mult-player is really a blessing in disguise. What David Beckham Soccer lacks in gameplay, it makes up for in savvy PR marketing. If you get tired of the game and want to get a better understanding of the man behind the game there is The David Beckham Story where you can learn that despite all the media attention he and his wife get, he is at heart a family man. After reading about his history and his interview, I have to admit that I have a little more admiration for the man. I wish I could say the same thing about the game. 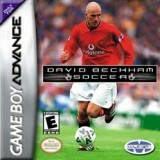 In countries where soccer, or football, reigns supreme, I\'m sure the Beckham\'s name will be more than enough to sell thousands of copies of the game. I wish that I could get my message out to them. I really don\'t have to warn the Americans, but I would like to make at least one altruistic gesture on a global scale in order to convince people that people in America do care about people around the world. I\'m asking people who speak other languages to translate this review and spread it around the world. Work with me to help unite the world against our common foe of mediocre gaming. We can\'t seem to agree on anything else; we should be able to agree on this.